Gun Collecting: Are Custom Rifles a Good Investment? Home Gun Collecting: Are Custom Rifles a Good Investment? Enter your e-mail address below for 10 timeless gun collecting articles from Gun Digest. Then receive even more information in a weekly e-newsletter. A completed David Miller Co. Marksmen rifle built around a Weatherby Mark V stainless steel action and barrel. I’ve often heard it touted that custom rifles are a good investment. My response to that statement is yes, no and maybe! In general, though, I do not think custom rifles are a particularly good investment. My opinion on that subject is pretty easy to support. Just take a look at some of the online auction houses like Gunsamerica.com and look at the listings under Custom Rifles. Last time I looked, there were rifles listed by many of the old masters in this business — Al Biesen, Dale Goens, Tom Shelhamer, Monte Kennedy, Joe Balickie, Charles Grace and many others. The prices are, comparatively speaking, incredibly low. Al Biesen, well into his eighties, is still going strong. There are exceptions to the above though. Back when I first met Dave Miller and Curt Crum, if I recall correctly, their Classic rifle, the only one they made at the time, was about $8,000. Had I had the ability to buy several at that price, I could certainly have made a tidy sum on my investment. In my experience though, it is much easier to lose a tidy sum on custom rifles than it is to earn one. I used to hit most of the gun shows in my area. I recall very well an old fellow who obviously had collected custom rifles for a long time. For whatever reason, he was reducing his collection, if not getting rid of it. On his table for several different gun shows that I attended, he had a table full of very nice custom rifles. His prices were more than reasonable. In fact, they were less than the cost of the components to build the rifle. I don’t know who made the rifles but they were very nice. Several of them featured pre-64 Model 70 actions and Mauser 98 actions. The stocks were all fashioned from English walnut, expertly checkered. They were all chambered for good solid cartridges, 30-06, 270, 7mm, etc. Whoever made them knew what they were doing and did it very well indeed. Yet, if that old boy ever sold one of the rifles, I didn’t notice it. The same rifles were on his table show after show. Had I been able to afford it, I would have bought them all. He could not even sell them at what was an obvious substantial loss. On the other hand, if one hitches his star to a rising talent that later becomes well known in the field, he may very well make a modest profit on his investment, but I’d bet he’d have done better investing the same sum in IBM or some equivalent stock. The investment possibility should never, in my view, be the justification for ordering a custom rifle. Actually, there is only one reason necessary and it is that you want one. That is justification enough and really, with minor exceptions, the only valid reason. Custom rifles don’t get much better than what David Miller Co. is producing. These photos and article are from the new Custom Rifles: Mastery of Wood & Metal book. While the book acknowledges a number of custom rifle makers, it focuses on the works and procedures of David Miller Co. of Tucson, Arizona. This shop has been instrumental in numerous advances in custom rifle work during recent decades. 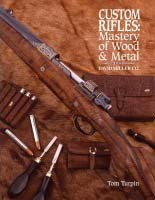 Click to order a copy of Custom Rifles: Mastery of Wood & Metal to read step-by-step how these incredible custom rifles come together. * Read about custom rifle stocks in this article from Wayne van Zwoll.